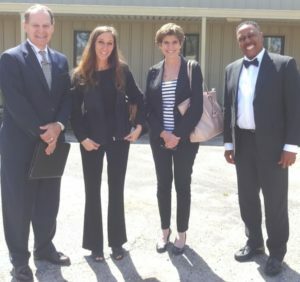 U.S. Federal Judge Keith Starrett, of the Southern District of Mississippi, recently visited the Dismas Charities Hattiesburg Mississippi facility along with his Secretary Debra Jackson, and U.S. Probation Officer Amanda Pierce. Director Chris Kelly hosted a lunch and tour of the program. The attendees discussed the newly-developed Employment Court, designed to help offenders without adequate employment succeed in finding a job. It is also designed to help them discover what type of job would best fit them given their skill set. The Judge was also seeking feedback from Dismas on what the courts could do to better improve the re-entry process for residents. They also spoke on their Cognitive Behavioral program, and courts on Problem Solving and Workforce Development. From left are Starrett, Pierce, Jackson, and Kelly.